Professor Hal Wegner has noted in his daily listserv that Judge Kathleen O’Malley has now been sworn-in as a Circuit Judge on the US Court of Appeals for the Federal Circuit. 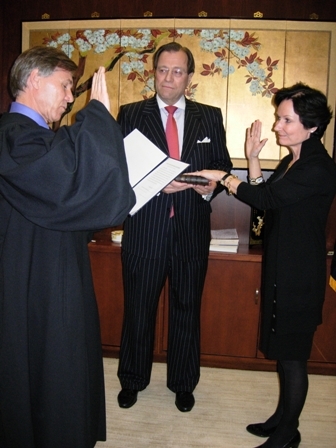 You can read more about the swearing-in ceremony on the Federal Circuit web site [Link]. You know what “PHONECASTING” is don’t you? I have to admit that I didn’t have a clue what “PHONECASTING” was until I listened to the oral argument of In re Sharp. Never having heard of the term before, I was surprised that it had been determined to be a generic term by the TTAB. The Federal Circuit affirmed that decision. The oral argument discusses whether PHONECASTING is generic or merely descriptive. It is interesting in that it discusses the fact that the TTAB relied upon WIKIPEDIA entries and the applicant’s own PCT patent application that defined PHONECASTING, among other evidence. You can listen to the oral argument here: [Listen]. The discussion of the Wikipedia articles takes place at about the 17:30 and 24:30 minute marks in the oral argument. The TTAB opinions are available [here] and [here]. The Federal Circuit Rule 36 affirmance is available here: [Read]. There were many talented advocates who argued patent cases before the Federal Circuit during 2007. I felt the following ten individuals distinguished themselves as ten of the best. These advocates were particularly knowledgeable of patent law, articulate, zealous, and persuasive. Actually, the list is based on cases decided in 2007; so, some of the arguments might have been conducted in 2006. The list of honorees for 2006 is available here: [Link]. Stay tuned for the lists for 2008, 2009, and 2010. President Obama spoke at Winston-Salem, North Carolina earlier this month where he noted that the US should make it easier to patent a new idea or a new invention. A few weeks ago, I noted that Judge Dyk had commented that the improper use of “Confidential” markings in appeal briefs was an “absolute plague.” [Link]. I ran across another oral argument from the last few years where Judge Dyk actually issued an order to show cause as to why the party that improperly marked material as confidential should not be sanctioned. [Listen] and [Listen]. The confidential markings had been applied to case citations and quotations in a brief. Research Corp. Technologies, Inc. v. Microsoft Corp. The Federal Circuit issued an important decision concerning “abstract ideas” and 35 USC §101 today in Research Corp. Technologies, Inc. v. Microsoft Corp., 2010-1037 (Fed. Cir. Dec. 8, 2010). If you are interested in listening to the oral argument from the case, it is available here: [Listen]. You are currently browsing the 717 Madison Place blog archives for December, 2010.